These are all times of extreme dexterity and chaos for many of us, and just because one has learnt to live with chaos doesn't mean that chaos is welcome. 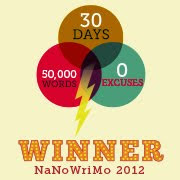 And that's as may be. Comes the time, more than often, when what one sees bearing down on one becomes intimidating and the ability to stay on an even keel leaves of its own accord. You can't knowingly coax it back, but you can recreate it. Recently I had trouble sleeping, freight train running in my head and all that, and The Wife™suggested I read some paper book. Not book on my cheapo yet faithful tablet, that involves that blue-biased backlight which doesn't really do your biological system any good, really kind of destabilizes it, and paper book reading is a very somatically satisfying thing to do, as one can find out for ones self by just doing it (hell, I just feel better holding a book in my had, but that's for another time). And my The Wife™, she know me well, and suggested. 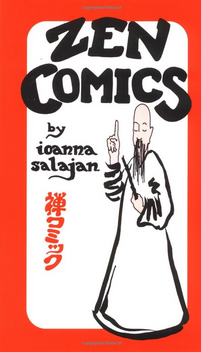 There is a pair of delightful little volumes called Zen Comics (not to be confused with the webcomic Zen Pencils). This modest collection of panels was drawn by a Buddhist named Ioanna Salajan, who was part of a Zen Buddhist community in Amsterdam back around the early 1970s, and they had a periodical called Cosmic Paper. She did these for that publication. What they are are little 4-panel (mostly; some of them break that to illustrate a joke or a theme) situations based on, as I understand it, Zen concepts or koans (and a koan, as I understand it, is a riddle or question that has no sensical answer, the point of which is to embrace the absurdity and acquire understanding from the point of view that provides). There are around 100 of them in all split between two rather small volumes, titled Zen Comics and Zen Comics II. They are all charming little things that you glance over, then glance over again, and then move on and come back to. At first it's the comic style seeming to combine brushwork and fine line; the whole artistic style, seeming at once unashamedly primitive and childlike but somehow simultaneously sophisticated; and the feeling that it's all trying to communicate with you on a visible and and invisible level. The comic has a handful of characters. The star, though I don't know if he'd say so, is The Old Monk, that chap on the cover graphic in the robe and that stylish beard with the head with the high dome. The co-star, who I've heard referred to as Number One Disciple, is his most frequent foil (and target of his switch) and serves as a relatable interlocutor. There's also Rinzo, a burr-headed chap who would be a Number One Disciple someday, if only he could figure some basics out. There are some other Zen practicioners, a few Western tourists, and one Samurai warrior who has an epiphany. There's a whimsy that makes it all approachable even if the point is frequently ineffable (something I also understand a good koan's lesson should be). And I don't know if I'm getting the point of it all, but reading it (as I have many times, it never gets old) again and again always makes me feel a kind, gentle humor within. It's been reprinted many times; my 2-volume set was printed by Charles H. Tuttle publishers back in the 80s. It's a pleasant reprieve for the weary mind. I recommend it to you. 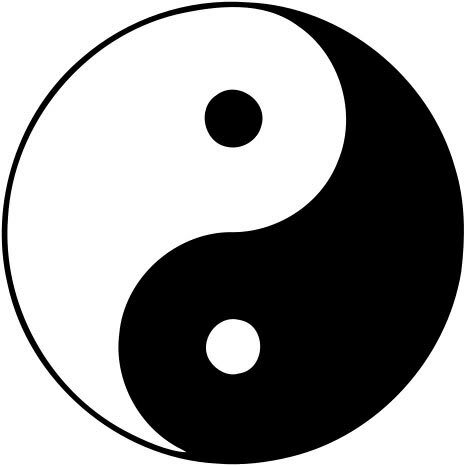 The other book I've been absorbing is Ursula K. LeGuin's rendition (as she says herself, it's a rendition, not a translation) of the Tao Te Ching. It's a pleasant looking book, small, square, containing two CDs of her reading it as music plays in the background. I've not listened to the CDs yet. I read it, like Zen Comics, frankly, not quite comprehending what I'm reading but it's speaking to me on some level. I love it because UKL did it, of course, but there is a comfort to reading these poems not yet knowing what they are totally supposed to say but feeling their truths falling into place in some internal way. Ursula K LeGuin's affection for the work makes it a soft, kind thing, and it too, helps me calm the anxiety. WinComadgeddon, an episode of PDXSnowpocalypse 2019. The scene: the Winco 122nd And Halsey store. Me and The Wife™ leave the Mighty Multnomah County Library midland branch after enjoying a recharging day amongst the books complete with Dutch Bros Coffee because that's the way you Library Day, and we decide we want to get a few absolute necessities before Snowzilla comes to town. Well, I get ahead of myself. But I figured it would be a task needing fortitude but not like the penultimate scenes to When Worlds Collide or Deep Impact, or maybe half that bad. At most. But how do you prepare yourself for something you've never seen and couldn't therefore envision? That you can't intellectually encompass because you have nothing to compare it to? The store was thronged, to be sure, but it was channelled chaos; bumpy but negotiable. Wife finds us a handy parking spot; with her awareness of human nature, while every last parking spot in the lot in front of the store was taken, the spots on the side near the Shari's were NOT all full. People think of the area in front and everyone (including me) gets that tunnel-vision; they don't think about the small lot on the side. Getting a cart was another challenge. There was not a free cart to be had. We had our library and Powell's City of Books bags and we went to work. The first real clue that we were not operating under normal rules came in produce, when we found that there was not one bunch of bananas left in the place. At Whole Foods, they came for the kale, first. Here in more proletarian Outer East Portlandia, first they came for the 'nanas. Walking off to bulk foods, we sang bars from "Yes, We Have No Bananas". because that's the way we roll. The rest of the trip was uneventful if not for the immense crowd. The 122nd WinCo is laid out like most WinCos; the dairy is at the back. As was the end of the line to the checkout. Down the dairy case on one side of that aisle; another proceeding the other way in front of the frozen foods case on the opposite side of that aisle. For a short time I worried it was all *one* line and I was going to be coming back that other way, but the WinCo logistics were immaculate; That line went to one end of the register line, our line to the other. WinCo planning for this was straight-up rockstar, in other words. Numerous incidences of simple human friendliness. This is when Oregon Nice comes out, in the transition between normal operations and crisis; oh, sure, if the apocalypse extends any more than a few days we'll be eating each other alive, but for the first few days, at least, we'll be cool with each other. My wife comes back with a cart after I, having secured a place in the line with a few groceries already, had moved out of the dairy aisle alongside the bottled water area, which was by now as dry as the Atacama. The only cat litter available was in a 40-pound bucket, at which point an estimable gentleman donated his cart to her after concluding that he could carry what he had out to his car in his arms. And I'll never have the opportunity to thank him, alas. Well, we paid that forward in our turn anyway. So that goes. We waited in the line for check out, chatted philosophical (I can't speak for my spouse but I'm definitely in that phase of life) and exchanged conviviality with the others in the line ... and we checked out of Checkstand 1. That's how you know this was a capital-E EVENT. Because, my friends, Checkstand 1 at your average WinCo is the one farthest away from the entrance. It's in the booneys, as the WinCo layout has it. In that way, it's a shame that me and my spouse never had kids. We'd have grandkids who were infants by now, and in a few years, we'd be able to tell them the tale. About how the weather was so bad, back in Feb of '19, that we checked out of WinCo at Checkstand 1. The SJKPDX Portland 2019 Calendar Is Still Available! I had the calendar finished and was publicizing it on Facebook last month and it only now occurred to me to feature it here. Silly me! I've always been much better at designing than marketing. But here it is and it's still wonderful, and there is still 360/365ths of 2019 to enjoy it, which makes the $13.99 asking price still a very good value! It's a unique work; you've seen Portland on many calendars and posters, but never the way I do. And I have a most unique eye. Below you'll find a embed that'll let you get a preview, but don't stop there! Go ahead and treat yourself: If you can't be in Portland, you can at least have it on your wall. And it is the one part of Portland that anyone can afford. This is a favorite place because the thronging of civilization is there in front of you, and beyond, impassive yet warm, is the local geography, which, to the degree it can, runs on its own clock, by its own rules. It does not check with you. The Progress on "Flower Shop"
And now, here's the progress of the most recent PBN, PaintWorks' "Flower Shop". Details to follow. One by one by one. They Call It The Fair-Haired Dumbell. No, Really. Portland is in the midst of a building-boom, of course, economics being what it is here in terminal-stage capitalism, of properly Erisian proportion. It's only natural that someone or something in the collective psyche would snap. Here's what happened with it did. Back in the days of Mayor Sam Adams, someone got the brilliant idea to turn E Burnside and Couch from NE 14th to the Burnside Bridge into a one-way couplet; Burnside going east, Couch going west. Not only did it ruin a great visual approach to downtown on East Burnside, but it also improved property values (like any other corner of Portland really needed it; pretty soon, you'll be renting the air). This caused a change in geography in what we sometimes still call the "Burnside Bridgehead", that area where the east end of the Burnside Bridge comes back to earth. The sole corner used to be Burnside and Martin Luther King Jr Blvd. Now, Couch was changed to go one-half block west, s-curve south, then join Burnside to channel the westbound flow onto the bridge. The architecture, such as it was, was swept aside. An open space was created, and that's the way it stood for more than a couple years. Well, bring us up from 2014 to the present day. Ladies and gentlemen not of Portland, allow me to introduce you to what is actually called "The Fair-Haired Dumbbell"
When built, a local alt-weekly exulted Finally, architecture we can argue about. Across the river, on SW 5th, The Portland Building breathed an almost-audible sigh of relief knowing that there was finally a building in town that would attract more opprobrium. The building looks as though what you'd get if you engaged Willy Wonka as an architect. Your eyes do not deceive you; non of the sides are plumb. It's all angles. The windows are of various sizes and in seemingly random array. It's apparently an attempt to redefine the concept of 'building' as 'a structure you walk into and do things in'. The middle of the Dumbbell, showing the connecting walkways. As can be seen in the above picture, strictly speaking, the Dumbbell isn't just one building, it's two smaller ones connected by a sort of stacked set of skybridges. Just as you figure you have it figured, you find you figured wrong. Looking NW from the corner of East Burnside and MLK Jr. Blvd. There's another thing that one might have surmised in looking at this building; it is stranded on a smaller-than modestly-sized Portland block, surrounded with some of the heaviest street traffic in Portland, with minimal parking. That street parking you see on MLK is all the parking there is next to the building proper. There is a parking garage in that Death-Star-looking edifice behind it and on the left, and while I didn't peep the prices, I understand easy financing is available for well-qualified parkers, if you follow me here. And what a paint-job there, hey? Positively painfully Portland psychidelic. The Fair-Haired Dummbell is one of a kind; if Portlandia put a bird on this one, it'd have to be a cuckoo. But it casts a kind of a spell, you see; one begins to enjoy it despite every instinct in one that insists that this is quite possibly a crime against architecture suitable for prosecution at the International Court of Justice. Now, I've loved buildings and I've hated them. I have alternatively loved and hated them. But never before have I simultaneously loved and hated a building. The Fair-Haired Dumbbell is both joyously antic and fun and also rage-inducing ... and I hold these emotions concurrently. That alt-weekly was right. This is architecture we can argue about. I just don't know if they meant you can argue with yourself about it. Well, it certainly is old Portland AF. What this is is the sign for the old Joyce Hotel, over the corner of SW 11th Avenue and Harvey Milk Street (formerly Stark). And there is something evocative to the thing, the old flophouse sign, still there and still intact but for the stress of the years on the paint job, up against one of those classic downtown Portland street lamps, which I adore beyond sane reason. It profoundly emotionally moved her, which is a thing that I'll be even amateur photographers like myself as well as pros are surprised; you never know which one of your compositions will grab someone by the heart. Good news for this artist's journey: a new source for more PBN projects has been identified, thanks for avid scouting work by The Wife™. Art Media, of course, is no more, for a few years now. But, in the space it once occupied on SE 82nd Avenue at King Road, the Portland branch of Hobbytown USA has moved in. It is sweet! Portland area hobby lovers of things such as RC hobbies, model building, model railroads and things of that nature ought to get to know it if they've not already. It's well-stocked and friendly. They've also got stacks and stacks of PBNs, a great many of them the Dimensions Paintworks brand, which I've, over the course of merely one project, have come to love. I've acquired two more to do, after I'm done with Nicky Boehme's Taste of Italy. One is another Nicky Boehme design, titled Balloon Glow. Ethereal, atmospheric, and entrancing. The second one is a design by Fabrice de Villeneuve, Flower Shoppe, and it's down-to-earth, warm, and friendly. 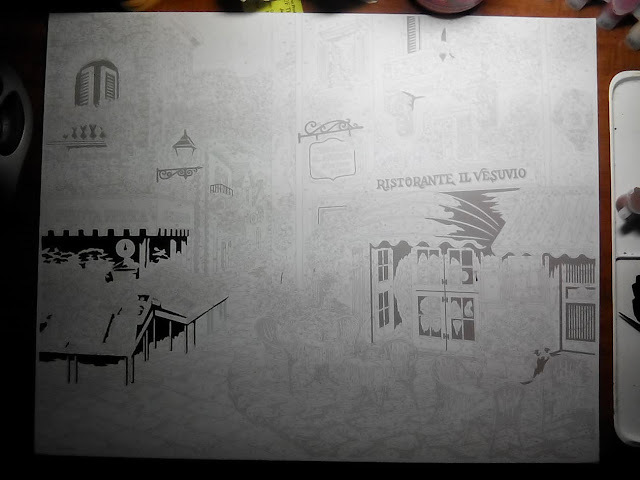 Another interesting difference about Flower Shoppe is that it's 11x14 and only requires 12 colors. I didn't know until this point that Paintworks came in anything other than 20x16 and 18 colors, but this smaller one presents the same elevated challenge that the other did. The projects call for two other painterly techniques that will make me up my game: "feathering", the technique of using short choppy strokes to cause a visual blend, and stippling. Also there seems to be the necessity of using a wash.
Paintworks continues to be the PBN that teaches as well as keeps the hands busy, engaging the mind on a more sophisticated level than other producers. I look foreword to these next two challenges. Southwest Stark Street is no more, kinda sorta, for a five-year transition period. But the street blades honoring the late San Francisco Supervisor Harvey Milk are up now. And for the next five years, the street will wear both names on the signposts. This is how we transition street names here in Portland. The proposal by the businesses along the street supporting it and detailed at The Harvey Milk Street Project was to have the thirteen blocks of SW Stark Street renamed only, in honor of Harvey Milk who, in his highly visible position as a legislator in one of America's pre-eminent large cities was amongst the first openly gay people ever elected to such prominence, was assassinated in 1978. Also, for a period stretching roughly from the mid 1980s to the mid-2000's, that area stretching along Stark from approximately 11th Avenue to 13th Avenue was the hypocenter of Portland's gay culture. The list of nightclub names still doubtlessly rings legendarily in the hearts and minds of Portlanders gay community: Club Portland, the Fish Grotto, Boxxes, the Red Cap Garage, Scandals, The Roxy. Of those, only The Roxy and Scandals remain, however tenaciously, against the advance of gentrification and the McMenaminization of everything between SW 12th and 14th along West Burnside. This was where gay Portland came to hang out and play, a place that was thiers. The building in the picture above is the Joyce Hotel. Its first floor, there on the corner, was home to the Fish Grotto. The Fish Grotto is no more, having closed in 2014. The space next to it, which now holds a totes adorbs little alley-mall style boutique collection called Union Way, once held Boxxes and Red Cap Garage. Boxxes moved to the upper floor of the building on the SE corner of Burnside and SW 11th before it winked out. The old sign for the Fish Grotto still remains, as does the board that once supported the sign for a latter-day subdivision of the Fish Grotto called the Sand Bar. Now it, as well as the Joyce Hotel itself, one of Portland's last great flophouses, stands in stasis on the corner of SW 11th and then-Stark, now-Harvey Milk Street, a ghost of Old Portland in solid, tangible form. The corner of Harvey Milk and 12th still has remnants of the Portland what was. Note in the picture following the Peterson's Grocery on the corner. That's been a corner shop there for a very long time; up until the Peterson's near the library on Yamhill was evicted, it was Georgia's Grocery. The other two survivors, Scandals and The Roxy, are the market's neighbors. In the picture above, if you look for the al fresco parasols; that's Scandals. Over Scandals, there's a true antique. I'm glad they left the sign up that declared that this was once Georgia's Laundromat. And ... The Roxy. What a splendid pageant that place is. We adore it. Funky as well, pictures all over the walls, you go in there and all of a sudden you feel like you're in 1987. And the food? All bad for you, and when I say bad for you, I mean if you don't eat once here before you die, that would be bad for you. Burgers, nachos, bad for your arteries but oh, so good for your soul. We will always love The Roxy. How it hangs on in this area of ascending property values I don't know, but I hope it stays just this way for a very long time. The Daily Paint By Number: The Italian Fruit Stand Is Painting, And We Branch Out. The progress on Taste of Italy so far has accelerated since my health has improved after getting over my cellulitis infection. There were two kinds of solid-colored area to fill in. One was solid black, which was filled in with black; the other, a gray area, which was filled with a mixture of colors 7 and 15, which resulted in the charcoal-gray that now sprawls across the picture. I like the sense of space the foreground defines there. This took about an hour and a half to totally complete. This is one detailed project! The fruit stall was my rite of passage into this work. I'm pretty sure I've got the skill to finish the rest of it, providing the paint holds out. I'm still a bit intimidated by the instructions that mention in case the paint runs out. I'm sure ordering more paint for this would be an ordeal, so I'm going to be mindful of this. When I was but a neat thing, and a kid in then-bucolic Silverton, Oregon, I remember there was a sporting goods shop on North Water Street between Main and Oak, on the west side of the street, called Chuck's Sport Shop. The building is still there, of course. There's some sort of bistro or cafe there now. Lovely place. Lots of wood. I remember going in there with my dad, I think he was after some sort of fishing gear, and I remember seeing, under the glass top of the front counter, these things that looked like money. Silverton Scrip, they were called. And I kinda fell in love with them. They were nicely designed; centering on a portrait oval of Silver Creek's South Falls, which is kind of an iconic thing to Silverton, they're still the most attractive currency I ever saw. Latterly, on FB, a similarly-historically-inclined friend, Michael Long I think, put up an example of Depression-era 'scrip' from Multnomah County. I'm not 100% clear on the concept, but I have the basics; since you couldn't depend on your bank to be open or to even exist in the near-term, but commerce still had to happen, localities would issue their own temporary currency, or 'scrip', backed by some local source of credit. In Multnomah County, it was backed by the County Treasury. In Silverton, it was backed by what were called "Marion County School Warrants". But I digress. Dig these. Like I said, isn't that lovely? Thanks be to the Oregon State Library online, who knows how to do the historical job. It was issued by the local American Legion Post, which was apparently seen as a trustworthy authority, and had a limited duration of effectiveness. This, indeed, is a 25-cent bill. While everyone could find a printer, minting coin was apparently something not everyone could do. There were other denominations ... I believe I saw a $1 scrip once. ... because you can have scrip and you can have scrip (up in Wallowa County they stamped 'em out on buckskin, I've found) but your scrip isn't really Oregonized unless you can have a Homer Davenport cartoon on it. That's Silvertonian flair. And if we ever have to have a local currency, I say, go with this design. Silver Falls is the crown jewel of the Oregon State Park system. You could easily do worse! I've begun painting the PaintWorks piece Taste of Italy. And there is a ton of detail here and with the glorious opportunities thereunto and the advanced techniques I have a chance to employ, I get a 'tyranny of choice' situation. It's impossible to choose where to start. When I begin with color, though, I know where it's going to start (thanks to a suggestion from Library Gordon), but first, I took he simplest choice. Just do the black areas. As earlier pointed out, the black areas are picket out by regions of darkest tone. On the diagram chart, they are starkly black; on the panel, with its screened-back printing, it's a very very dark gray. Still easily identifiable; it's the single darkest tone. Just cover it with black. I started in the dark areas in the fruit stall. This took somewhere between 30 and 60 minutes of work, for two reasons: I was getting the feel of a new brush (Richeson's Gray Matters #2 round, which has immediately become indispensable) and the desire to make it a sort of meditation. PBN is great for this. After two days of work, I nearly have the entirety of the simply-black spaces covered. 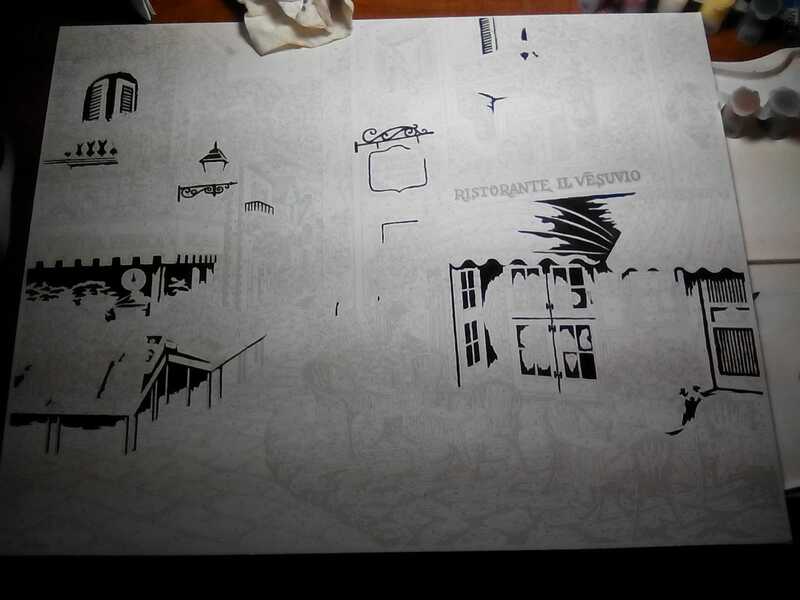 After blacking-in the RISTORANTE IL VESUVIO lettering, that'll cover it. 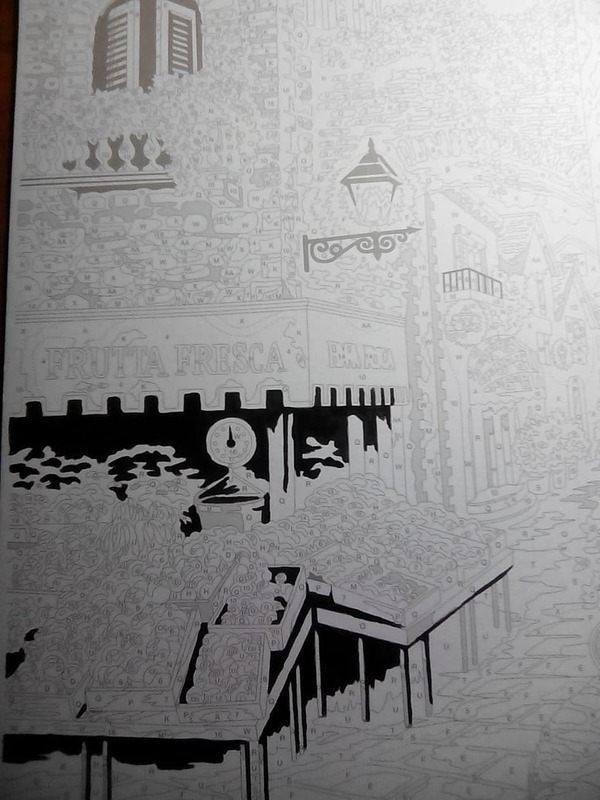 This detail shot gives you the idea of what the black areas on the panel looked like before coverage, and after. After the sign is painted, on to the first applications of color. It's evolved that one of the things I'm coming to greatly enjoy as age presents itself to me is the idea of antique and vintage art instuctionals. 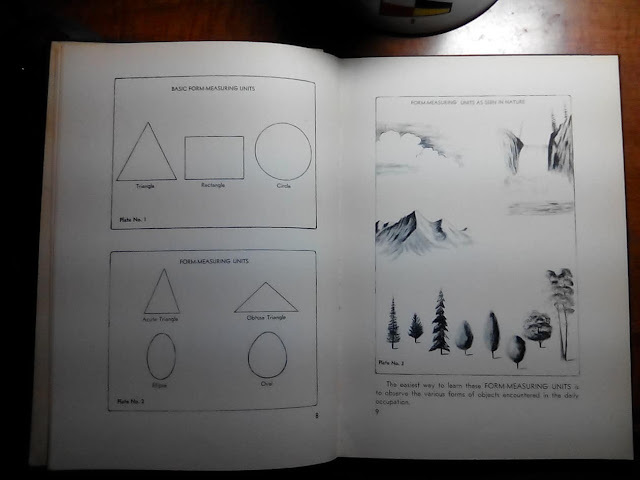 There have been people who want to make a living teaching the average you'n'me how to make drawing a hobby for at leastas long as there's was a Bill Alexander and even longer. 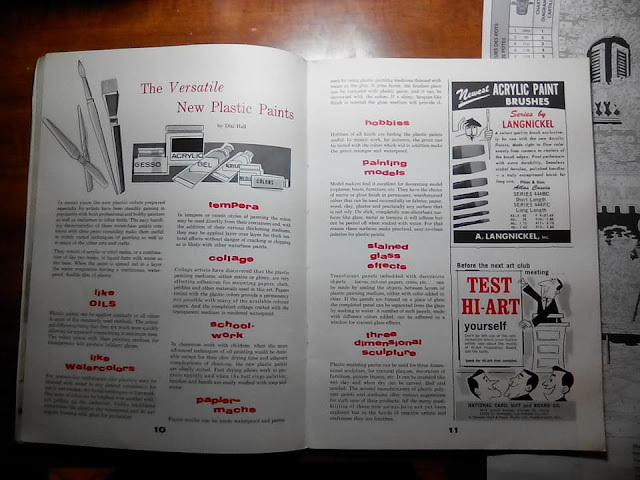 The art publication in the last missive was printed, as near as I can determine, in the mid 1960s. If that seems and antique, how about one from the Great Depression? 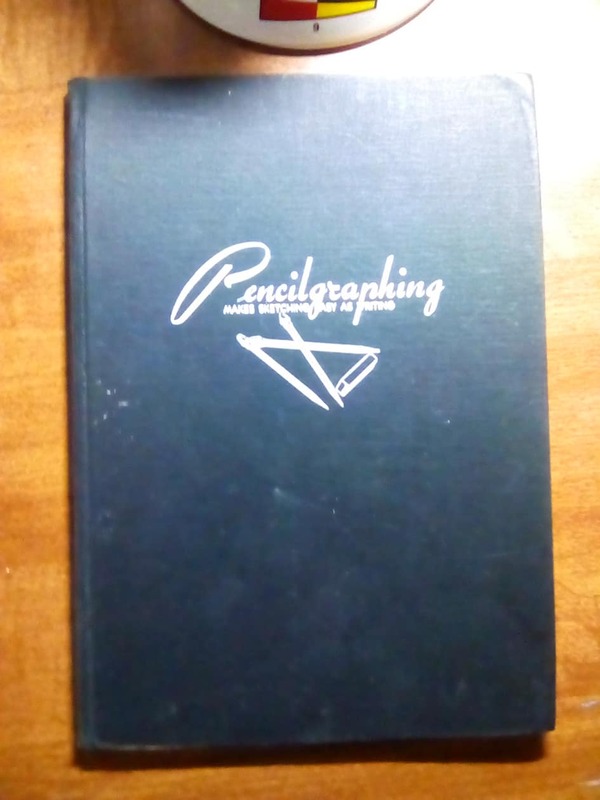 Pencilgraphing is the title of this slim, black hardback book I found at Powell's for a song on Saturday. 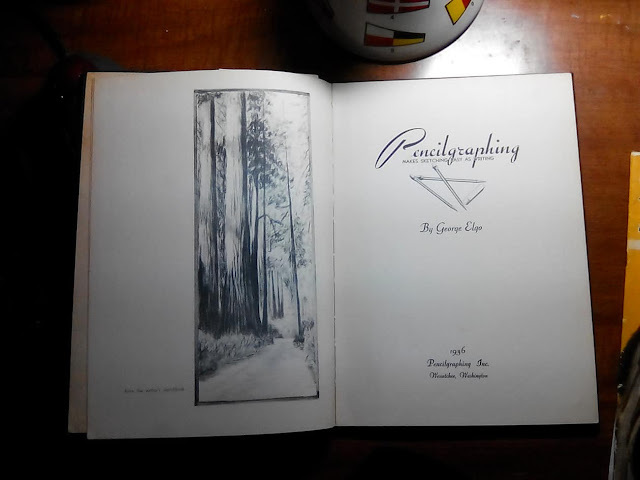 It was published in 1936, by Pencilgraphing, Inc. of none other than little ol' Wenatchee, Washington, and the tagline is Makes sketching as easy as writing. The title shows three pencils askew of each other and a chisel-shaped eraser similar to a Pink Pearl. The title pages is handsomely laid out on the verso with an asymmetrical illustration from the author's own hand, presumably the calibre of the work one might eventually produce with diligent practice of the technique. Like many artistic techniques, George Elgo's teaches you to reduce things you want to draw into the simple forms. In his specialized lingo, the basic shapes are measuring units. Every method maker wants thier own rubrics, and Elgo was apparently no exception. The tools are simply enumerated: four erasers, three pencils, and a sheet of 00 sandpaper. The pencils are B, 3B, and 6B. Three of the four erasers are those wedge-shaped cap erasers that we all put on the ends of our pencils in grade school when we wore the standard erasers down, and the fourth is the larger, Pink Pearl-style erasers, which are important for their chisel-shaped ends. 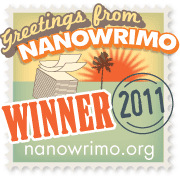 The drawing ground was simply specified as typing paper. So, the tools are at least accessible. After a dead-serious couple of lessons introducing the aspiring Pencilgrapher to the basic thin strokes and how to make shading and modeling (massy) strokes, the catalyst is introduced in the use of the erasers. The erasers are mostly used in this method as a stump or tortillion is used in graphite and pencil art - for blending graphite and modelling shade. Think of the way Bob Ross uses his palette knife to lay in the shading on the side of mountains and you'll have the basics of the idea. In the case of the large chisel eraser, this is used to 'cut' lines, produce highlights, and for blending out or removing large areas of shade as needed. 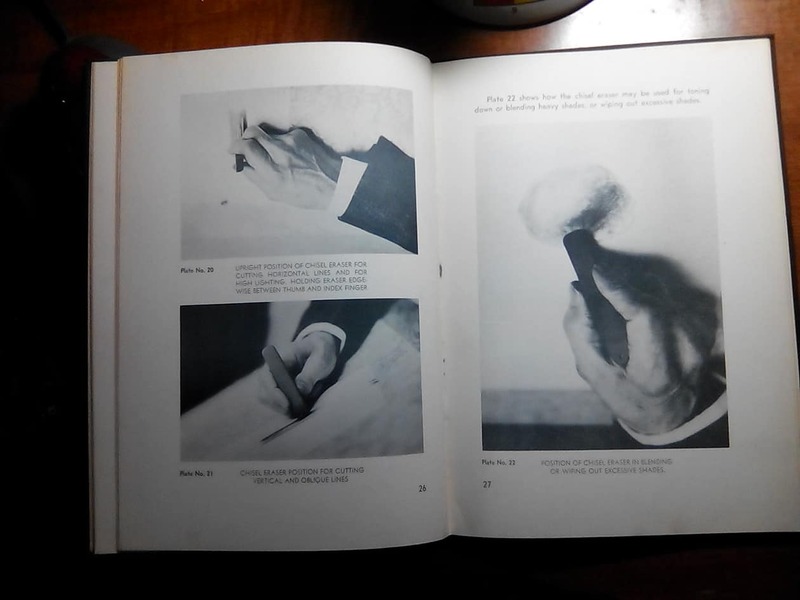 The sandpaper comes in when you want to do 'modeling': the 6B is scratched against it to leave graphite which can be picked up from it with the wedge-shaped eraser, which is then used to stroke graphite on the paper in the manner of a paint brush. The sandpaper also cleans off the eraser's surface and keeps the edges of the erasers keen as well as shaping the pencil point. 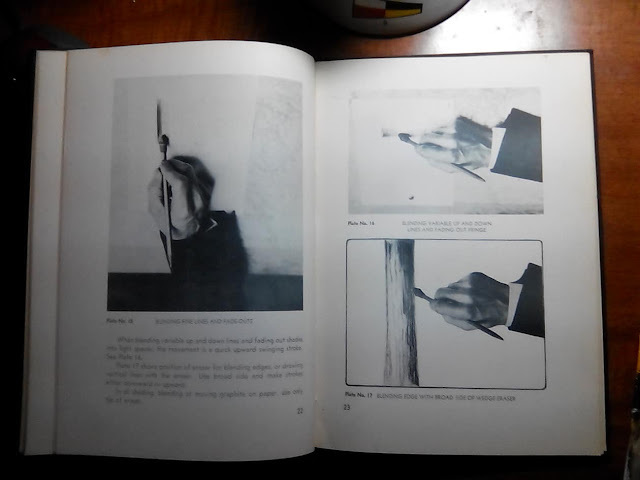 The combination of specialized, simplified strokes with the intentional use of the eraser as a drawing tool and the consolidation of all activity on the pencil brings everything into one functional concentrated place where you're using the pencil like a combination of pencil and blending tool and this is where the author evidently felt that sketching would be as simple as handwriting. It has some merit. I can see some aspects of it that can be used in any drawing practice, and the dependence on the eraser as an all-purpose blending tool isn't wholly innovative but was a fresh approach to the aspiring artist coming from a layman's perspective. 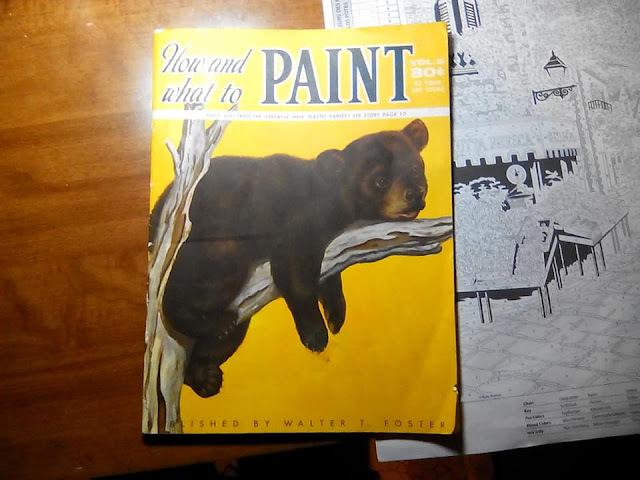 Very old how-to-draw publications find their way to Powell's, as I've shown before. This one here is an unexpected delight, and timely into the bargain. This is the front cover of what appears to be a periodical, or at least an occasional series, called How and What To Paint. Charmingly cover-priced at the modest amount of thirty cents (at your art store). The publisher, that titan of how-to-do-art books, Walter T. Foster. This, volume 5, concentrates on three main things: How to draw bears (hence the cover art), mixing colors, and an exciting new thing ... the versatile new plastic paints. 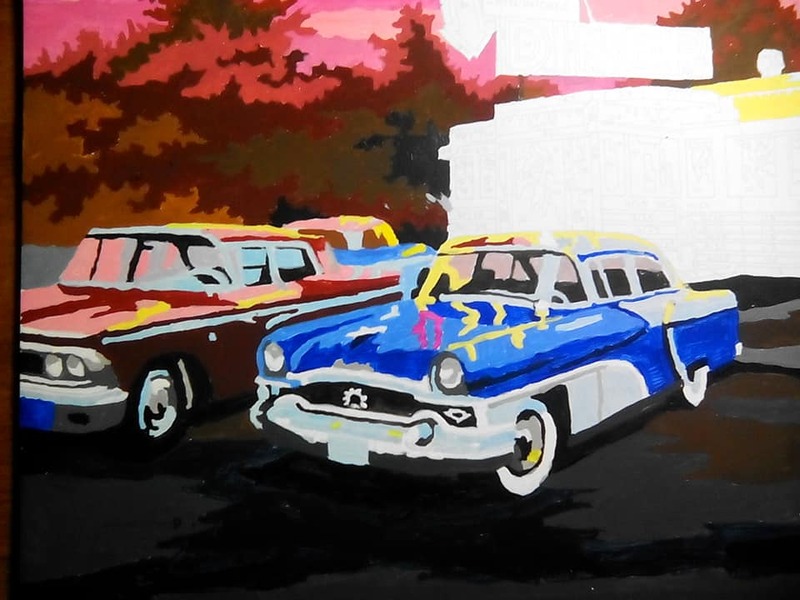 What that is, of course, is acrylics; acrylic paint media is pigment emulsified in an acrylic polymer medium, and acrylic polymer is a type of thermoplastic. 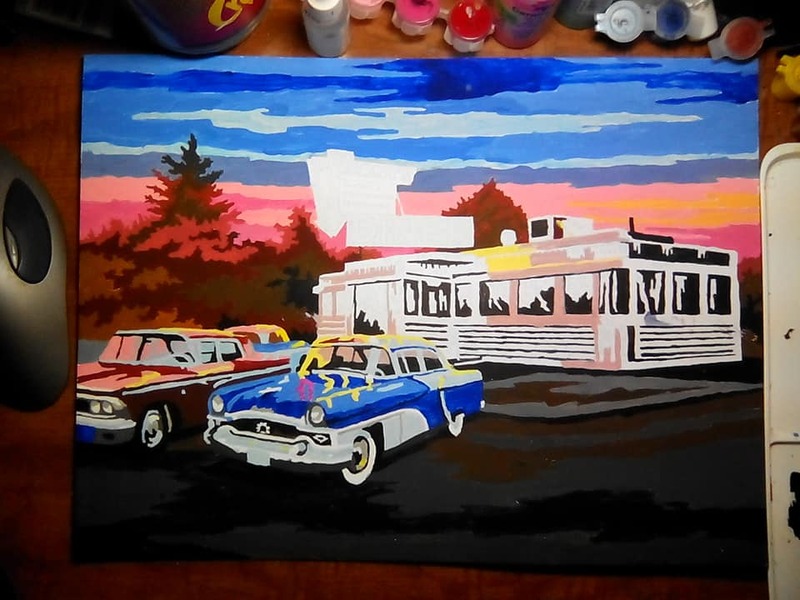 When you're painting in acrylic, you're painting with plastic. The number is undated, though an ade for a brand of mediums and varnishes on the back cover features an oil by Frederic Taubes dated 1964, so it certainly can't have been published before that, quite obviously. Given my recent excursion into the acrylic medium by way of PBN painting, finding this historic jewel is both timely and serendipitous. 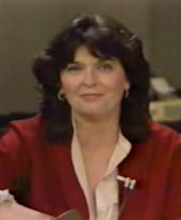 As exultant the article, penned by managing editor Dixi Hall, was, the charming ads really win. Brushes from Langnickel, and illustration board from Hi-Art, a brand of the National Mat, Card, and Board Co, which exhorts the reader to request free Hi-Art samples, so they may not be left behind when all the other fellow artists rave about it at the next art club meeting. Truly, we have come so far. So, this is a first for this blog ... an 'unboxing' post. Only this isn't any sort of tech toy. This is a Dimensions PaintWorks PBN kit, the most advanced one I've seen yet, a light-year ahead of any I've done so far. The-clock-she-is-a-ticking, so let's get started. PaintWorks is a brand that is part of the Simplicity family of art and craft products. It is a large-format, detail-oriented work intended for the ambitious PBN enthusiast who loves detail and is ready for a challenge above and beyond the more pedestrian Royal & Langnickel works. The above is the box for PaintWorks #91320, Taste of Italy. It is, as can be seen, a charming, idealized Italian village street scene, bursting with color and Old World pulchritude. This is 20 in by 16 in. Compared to the works I've been doing so far, this is like a large dining table with the extender in. A couple of things of note here; the piece actually credits the designer (an early sign we're working on another level here) and the picture, if one lets the eye linger in the details, seems to be of the completed PBN work itself, not the detailed picture that the project was abstracted on. Let's empty the box, shall we? Here it all is: eighteen snap-together paint pots, the project panel, and a chart sheet with painting diagrammed and charts detailing the paint pots and the various color mixes. Here, the paint pots unsnapped from their circles and laid out in rows. Note the colors are printed on the fronts of the pots, a real boon ... no scrawling them on the cap in Sharpie this time! SCREECH! Hold the bus a moment, driver. They actually anticipate you running out of paint? I'd best paint wisely. As the website on the box is no longer operant and the pages at Simplicty.com that list the PaintWorks kits have no obvious route to ordering replacement paint, a side process here will be researching if that is possible at all. This is a big panel. I can get started but I must do so thoughtfully. Anyway. Onward into the materials. This table on the chart is a listing of 'pot' colors ... the unmixed paint. Two points of note: 17, black, is noted on the table with a black swatch. This is one intriguing new thing; the solid black color areas on the panel are where you put the black. You'll have noticed them by now in the picture above where I've arrayed the paint pots; look just below at the solid dark colored areas. I'll just be going over those with black. Paint color #18 is a thing I've not seen before. It is only used in mixes, never appearing unmixed in the painting. And, this table lists the mixed colors I'll be creating to complete the painting. This is different from the others, if on the other kits I was to mix #1 and #7, for example, it would be noted as "1/7" on the panel. Here, it's simply A. Also, see the space on the table that has "7 + 15", how there's a gray swatch next to it? Just as there are solid dark areas to be covered with black paint on the panel, your 7/15 mix is to cover gray-filled areas. Pretty smart and just the thing for those of us who like 'work-y' art. I have a feeling I"m going to love this. Here is a closeup on the chart. Here's an important thing. The dashed lines indicate areas that call for a rather advanced painting technique for PBN ... drybrushing. This is meant to produce a visual blending effect. More on this just down the posting. Here's a closeup of one of the thoughtfully-designed paint pots. They open and close air-tight but easily, and the wide base makes it very stable. And here's the instructions on drybrushing. You drybrush along the boundaries that are dotted lines to give the appearance of a gradated blend, and a more sophisticated finish than your more average PBN work. And the way this is taught, it instantly occurred to me that this is a portable, and also rather sophisticated skill. This kit is teaching a fairly advanced technique in the context! Exciting, really. In the way that I used marker in the last work to make it sort of a multimedia thing, the instructions indicate detailing with marker or pen may be called for. Withal, this looks like a project that will teach as well as entertain in the doing. I can't start it immediately but very soon, and I can't really wait to get started ... though I'll have to! Check in here for the painters progress. So, I glide-pathed gracefully into the end of Royal & Langnickel's PAL28-3T: 50's Diner. Of the various projects I've done since PBN has re-introduced itself to me, and me, it, this has been by far the most fun and satisfying. Whoever designed the kit knew just what to leave out and put it. The rendering of the illustration onto PBN abstract was immaculate, as far as I'm concerned. As I've mentioned under other aegis, the plan was to work from the outside in. That meant sky, ground, foliage, cars, building, sign. It worked out very well in this one. The above picture was the first fillins to the building, which was, by then, the only part of the picture remaining un-painted. The long lines and straight spaces contrasted interestingly with he ripply reflections in the windows. Filling in the rest o the windows and getting the dark areas in the building gave it solidity and dimension and really started to make the painting pop. The completion of the sign atop the diner was the final pin that the logic of the lighting pivoted on. The bright yellow of the neon in the word DINER gave the yellow areas of reflected light on the cars and the building's side its internal sense. It was also terribly much fun to do. There area couple of small things that actually makes this, by definition, multi media. 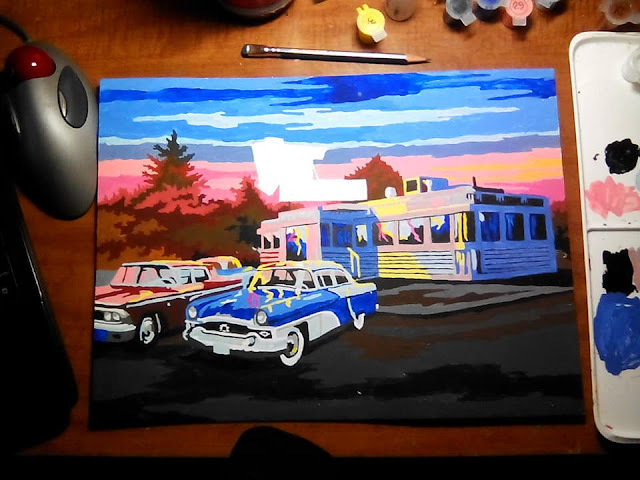 The black print on the sign and the numbers on the license plate have issues; the plate gets covered up by the light blue and the part of the sign with the writing on it is unpainted (that's the panel showing through) and the writing is in the same screened-back blue that the rest of the painting's marks are. Fine line Sharpie to the rescue! 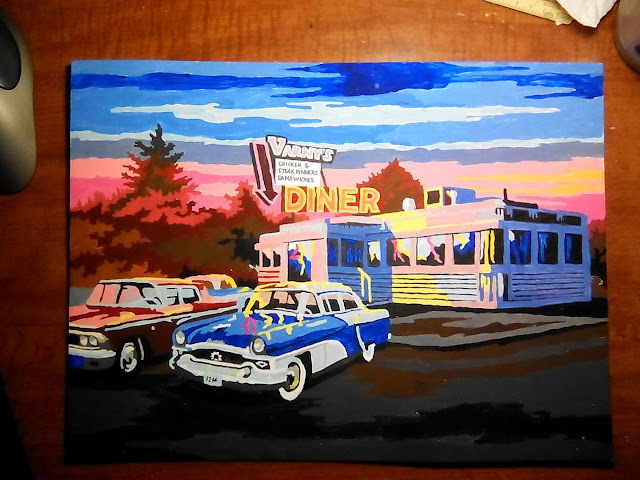 So, I can truthfully say that this is a work in acrylic paint and marker. Multi-media artist, me, now! And we'll put this one on the wall near the others. It should be a centerpiece, really. Next up, we have an uncommon thing for this blog ... an unboxing! And it all has to do with the next project. The recent fun and adventure of The Daily Paint By Number series has really turned me on to the idea of painting with acrylics as an ongoing thing. There is a great deal about painting with acrylics that I've heard: They're versatile, vibrant colors, can be impasto'd like oils but flow and mix like watercolors. All this, I've found to be true, even with the cheapo barely-student-grade acrylics included in the Royal & Langnickel kits. They are quick-drying, yes. But that's something you can learn to anticipate. These PBN acrylics dry in under a half-hour (hell, I think it only takes about 15 minutes), but if you stay on top of it and keep thinning it with a little water (just a drop, literally, will do) you can keep painting as long as you keep paying attention to the work. For someone who's using art making as therapy and meditation, this hits the mark exactly and satisfyingly. Last night, at Powell's, I found a couple of great books on the deep information on painting with acrylics, generally. The Wife™ has a few books from when she was experimenting with acrylic painting and I'm looking into those as well. So, here, the exploration begins; I'll still work the PBNs, because when you want to do art but have nothing in mind, they're just the thing to practice one's touch and develop dexterity. Mixing paints is fun, too! Yesterday, at I've Been Framed, I've gotten a few extra brushes. I already have a number of watercolor brushes of various sizes, but so far, for the detail that PBNs sometimes call for, the #2 Round is proving to be a real work-horse. I got a #1 and #2 Round made by Grey Matters by Jack Richeson, and spouse found a #2 Round Liquitex in the bargain bin out on the sidewalk. I strongly encourage anyone wandering in the Foster Powell area and looking for real art-supply bargains to check the bins out on the sidewalk in front of IBF. Such great found-objects, clearance and used-but-still-usable art supplies you'll find nowhere else in town, and it's one of the man reasons why IBF is a gem. 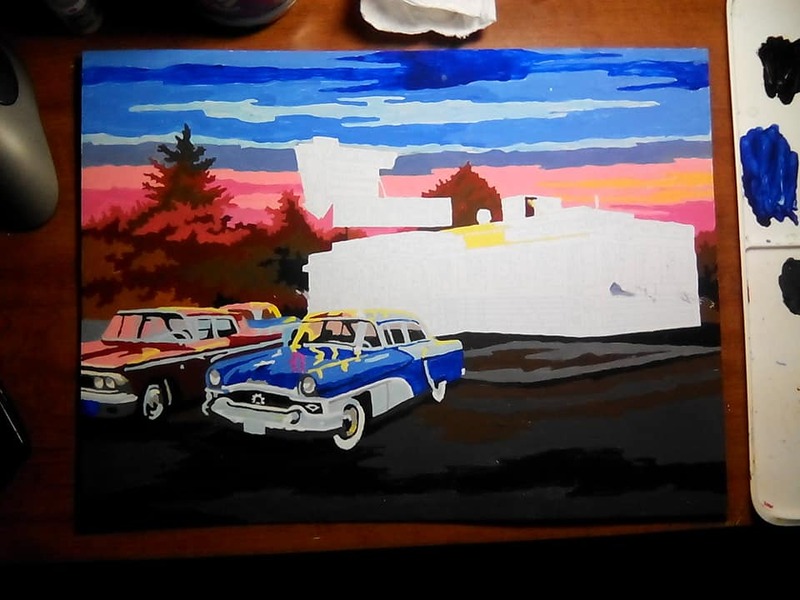 The detail on the cars is complete. The colors are rich and bold and fun. The richness and boldness of the colors really kind of kick this up to a whole 'nother level that Flying Fortress didn't go to, and that level has made this picture a whole lot more fun to do.